SL Land Owners Know your Rights! Parcel Ownership and Menus 101! I’d like to take a moment to ask people to turn off open build on your parcel. If you need to give certain members rights to build, rez etc, do so via deeding your land to a group. Go to the land and right-click it. 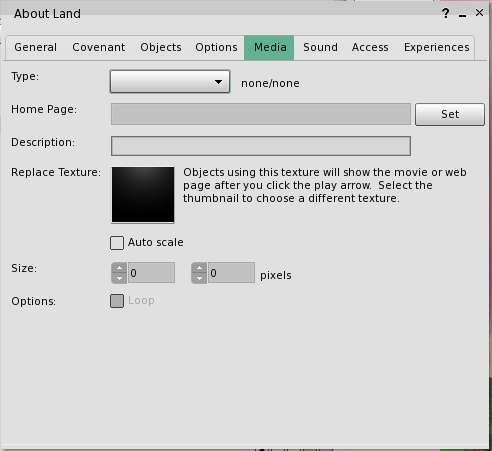 Select About Land from the pie menu. Select the group you want and click Set. Check the Allow Deed to Group box and click the Deed button that shows up after. Then go into your options tab and set build and object entry to group only and give members the corresponding rights that you want them to have via roles in group. This prevents griefings via object littering and scripts griefing…in those objects. It stops replicating objects from spilling over into your personal parcels as well, thus not affecting your items. Below you will find a list of each tab via about land and what each corresponding tab represents. Name – The name of the parcel which will show at the top of the screen when you are on the parcel, and in search if the parcel is set to show in search. Description – Additional description of the parcel which is visible in this window and in search results if the parcel is set to show in search. 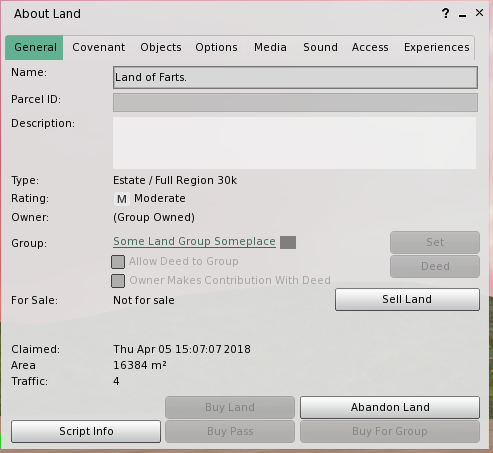 Owner – The avatar name or “Group Owned” if such who “owns” the land parcel. Normal users do not actually have ownership rights in the virtual land in the common real life sense of owning something. They have control over the parcel as long as they pay maintenance fees directly or indirectly to Linden Lab, who actually own the servers the map region is hosted on. In this sense it is more like a lease in real life. Governor Linden is the Account set up by Linden Lab to hold parcels assigned to them, as opposed to their customers (users). In this case, the listed owner and the actual real life owner is the same. The info button will open the ‘Profile’ floating window for the listed owner. Group – The group assigned to this parcel for the purpose of access or controlling settings. This is distinct from group ownership. The Set button will open the Groups tab of the Communicate or Contacts window in order to set or change the group assignment. Allow Deed to Group – Permits a landowner to sell the parcel to the assigned group. The owners of the group effectively become the new owners of the land. The Deed button opens the ‘Deed to Group’ floating window in order to transfer ownership. Owner Makes Contribution With Deed – When transferring ownership to a group, this check box also assigns land area from the owner’s land allowance to the group at the same time. For Sale – Shows for sale or not for sale status. If for sale, shows price and whether for sale to anyone, or a specific person. If you own the land, buttons to set for sale, not for sale, or abandon the land will appear. Claimed – The date and time the current owner became the owner of the parcel. Area – The horizontal area of the parcel. Sloped land is measured in the XY horizontal plane, not along the slope. Land is divisible into units 4×4 meters in size, so the minimum parcel area is 16 sq.m., and can be any multiple of 16 up to the full area of a map region (256x256m or 65,536 sq.m.). A single parcel must be entirely within the boundaries of one map region, but may consist of discontinuous pieces. Traffic – The number of avatar-minutes present on the parcel over the last measurement interval. Thus one avatar present for one hour = 60 traffic. The normal measurement interval is over the previous 24 hours, and is updated 2 times a day. 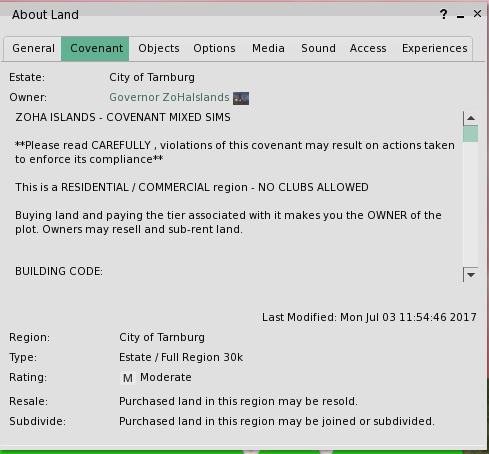 Estate: – Estates consist of one or more map regions with a single owner who has overall control over the estate and can set rules over and above the general Second Life rules. These rules are detailed in the text box of this tab. Name: – The name of the estate. There are approximately 5000 regions on the ‘mainland’ estate. These are grouped into 9 ‘continents’ (large groups of adjacent regions). Other large estates include Dreamland (# of regions? )… There are an estimated X total estates, consisting of nearly 29,000 regions total on the main Second Life grid or 3D world. (Untitled) – Text Box for entering and showing the Estate covenant. Region: – Map regions are the standard unit of the 3D world, with a fixed location in the 3D world map. They are 256×256 meters horizontally and unlimited in height, although placing objects is limited to below 4096 meters altitude. Name: – Each map region has a unique name up to X characters long. Type: – Regions may be Mainland or Estate, and Full, Homestead, or Openspace. Mainland regions may be owned in units of less than a full region, while Estate regions are only sold in full region units. Limits on number of objects and avatars are set according to type. 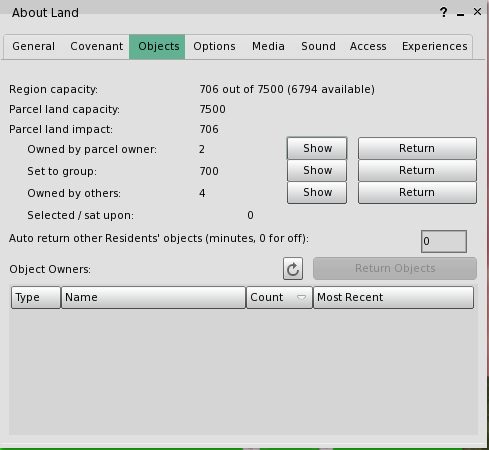 Full regions may have 15,000 objects and 40-100 avatars, Homesteads may have 3,750 objects and 20 avatars, and openspaces may have 750 objects and 20 avatars. Rating: – The maturity rating of the region determines the kind of activity and content is allowed in the region. It is one of PG, Mature, or Adult, and is set by the estate owner, or Linden Lab for mainland regions. WARNING: Returning objects en mass using this tab can easily remove items you did not intend to remove, so use with care, or return individual objects using the object context menu. Simulator primitive usage: – Shows the number of ‘primitive shapes’ (prims for short) used on the land parcels owned by the same owner in this region. If you own more than one parcel, the total for all parcels in this region are given. Also shows the total number allowed, and number not used. Complex objects are made of more than one primitive shape, so it is not the same as the number of objects. Prim allowances are shared among all parcels owned in the same region. You may distribute you actual objects as you see fit. For example, if you own three parcels, you can place all your objects on one of them, using the combined allowance of all three, and leave the other two empty. Primitives parcel supports: – Shows the number of primitive shapes the currently selected land parcel can have located on it. If the geometric center of an object is located within the parcel boundaries, all of its component prims are counted, even if some parts overhang onto other parcels. Prim allowances are proportional to land area as a fraction of the total allowed in the region. Hence if your parcel is 4096 sq.m., which is 1/16 the area of a full region, then it would receive 1/16 of a full region’s allowance of 15,000 prims, or 937 prims. Primitives on parcel: – Shows the actual number of prims on the parcel currently. The “Show” buttons under this heading will highlight the class of prims with white outlines, to make them easier to find. The “Return” buttons will take them off the parcel and return them to the “Lost and Found” folder of the owner. Owned by parcel owner: – The number of prims owned by the avatar listed as the parcel owner. Set to group: – The number of prims set to the same group as the General tab shows for the parcel. Owned by others: – The number of prims owned by avatars other than the owner or group. Selected/sat upon: – The number of prims currently selected or sat upon. Autoreturn – Allows a timed return of objects other than owner or group owned. If set to 0 the timer is off, otherwise will return items after a set number of minutes. This allows temporary placement of items. Object Owners: – If you have the correct ability as owner or group member, provides a detailed list of object owners by name and allows returning those objects when highlighted. This tab controls permissions and restrictions on the parcel for users other than the owner. Generally the parcel owner keeps full abilities on the parcel. Edit Terrain, Create Landmarks, Fly – If checked, then other residents than the parcel owner are permitted to do these actions. 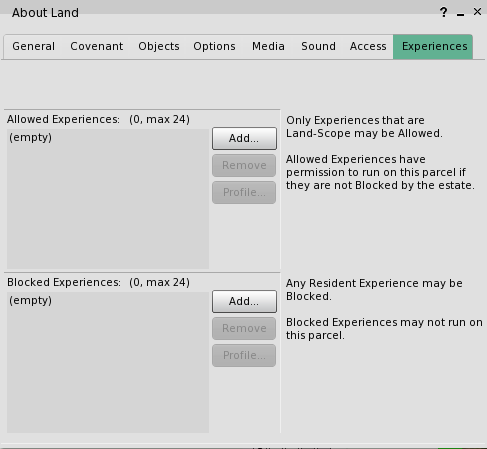 Create Objects, Object Entry, Run Scripts – These permissions are divided into “All Residents”, and “Group”, which refers to the group set on the General tab. Object Entry refers to objects not attached to an avatar, such as a bullet fired from a gun. Run Scripts refers to all scripts, whether in attached or detached objects. Safe (no damage) – If checked, the health % level is not displayed on the top menu bar, and avatars cannot be sent home when “killed” (health falls to zero %). Most land is set safe, except for areas intended for combat. No Pushing – If checked, then pushes from objects is disabled. Pushing another avatar is often used to annoy them, and most regions have turned on this item to prevent it. Show Place in Search – If checked, the parcel will be listed in the “Search” floating window with the name and description from the General tab, and the snapshot below from this tab. A fee of L$30 per week is charged for listing in search, and optionally a category can be chosen from the dropdown menu on this item. Mature Content – One of the region maturity ratings is “Mature”, but parcels are not required to have mature content on Mature rated land. This item is intended to indicate that there is mature content on the parcel. Snapshot – This image will be displayed in the “Search” results and landmarks created for the parcel. Clicking the image area will open the “Pick: Texture” floating window so that you can choose the image to display. Alternately, your chosen image can be dragged from your inventory to the image area. Landing Point: – Lists the coordinates of the landing point if set, or (none) if not set. The set button will set the landing point to your current avatar position, and the clear button will unset it. Teleport Routing: – Determines where teleport landings are allowed for other users. Blocked = Teleports into the parcel are not allowed. Landing point = teleports are limited to the landing point set above. Anywhere = teleports may arrive at any location on the parcel. This tab sets audio and video settings for the parcel. 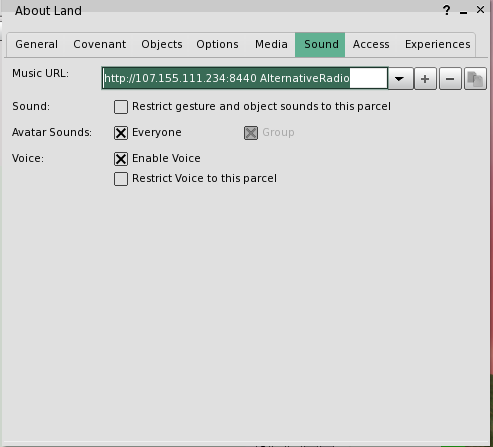 In general, only one audio and one video stream or web page may be set at a time on a single land parcel. 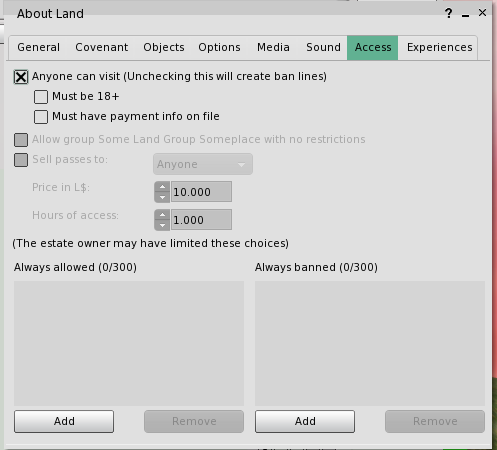 This tab controls who may enter the land parcel. Allow Public Access – If checked, any user may enter, subject to any restrictions set below. Residents who have not given payment info to Linden Lab – Payment info is a credit card or Paypal account which can be used to pay for Second Life services. If this box is checked, then accounts which have NOT given this information will NOT be able to enter the parcel. Residents who are not age verified adults – Age verification is providing ID information on the appropriate Second Life website page to show the account holder is over 18 years of age. If this box is checked, then accounts which have NOT given this information will NOT be able to enter the parcel. NOTE: This function is known to work erratically. Allow Group Access: <Group Name> – If checked, members of the listed group may enter. Sell passes to: – Seldom used, gives temporary access to the parcel by paying a fee. Allowed Residents – Gives access to individual users by name. Limited to 300 names. Banned Residents – Blocks access to individual users by name. Limited to 300 names. The Add buttons for the last two items will open the “Choose Resident” floating window. Highlighting one or more names on the lists, and clicking the Remove button removes them from the list. Link to experience wiki and information.